This bike was built by myself in 1973. 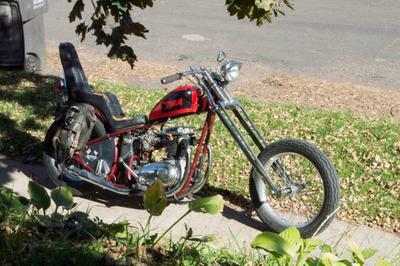 It's a 1969 BSA Thunderbolt. The frame is a hard tail, and a rake that is just enough to keep the motor level. The motor is a 196BSA Spitfire and it has a 32MM Mikunis Boyer Electronic Ignition, a James Wide Springer that I put on in 1975. I rode this bike every year since 1974...my red bike.